Mobilink, the largest operator in Pakistan has always faced issues with respect to their third party resource, THE FRANCHISES. We have previously witnessed a huge strike by Mobilink franchisees in Karachi which was in the sales leadership of Irfan Akram and now in the sales leadership of Jahanzeb Taj, it’s the franchisees in Multan who are not happy with company’s managerial policies. 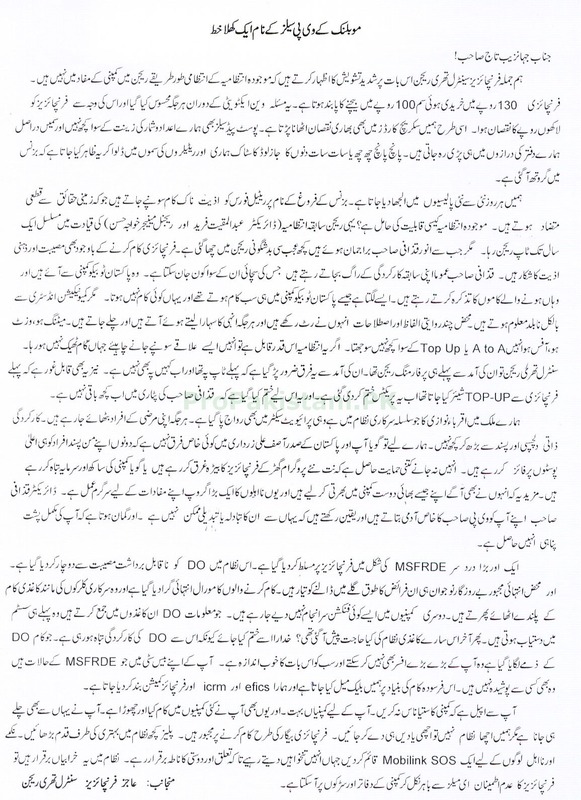 The franchisee union in Multan region have written an open complain letter to Jehanzeb Taj, VP Sales, Mobilink, which we have confirmed from multiple sources with-in the company and the franchises. Franchisees have shown serious concerns about the regional mis-management practiced by newly hired regional heads and the way it is impacting their business and ultimately the company’s sales and revenues. Franchisers from Multan said that the region is performing weirdly which topped in sales for one year, under the control of previous regional manager. They have threatened that they can come on road for strike if their demands are not met. This is one of the many examples set by franchisees to openly oppose company policies. Franchisee don’t want to work under the newly imposed regional polices. Franchisee are bound to sell SIMs in Rs.100, purchasing cost of which is Rs.130 – that give them a total lose. Franchisees have clearly mentioned prosperity while working under the regional leadership Ex-Regional Director, Abdul Muqeet Fareed and Ex-Regional Manager Khawaja Hasan but the the newly induction of Anwar Qazzafi, the franchisees are in immense pressure. Last but not the lease, the franchisees have requested the Management to improve their system and procedures and work honestly so that it’s a win win situation for everyone. for years the franchise people have been minting money from the telecom operators and now the tide has turned and the telecom operators want their pound of flesh these guys are up in arms. let the burn i say, let them burn, crooks every last one of them. This is their internal politics, which are doing by SD & RM to promote their personalities. Earlier this was done in Karachi as rightly said in above article during the tenure of IA. Chaudhry Sb, Yeh sab joth hai, dosron ki boli na bolo. Aur yeh propeganda band karo. Qazzafi Saheb buhat hi professional insaan hai. Agar puraney director aur regional manager saheb itney champion hotey tu aaj jahan woh bethey hai woh region bhi utha detey. Yeh sirf or sirf hamerey franchise bhai hai jo Mobilink ko chala rahey hai. Pata karna hai tu pocho un franchise bhayon sey jahan woh abhi hain. I think that all the MNCs have started exploiting their business partners (franchisees and distributors. Every new top man in the Company wants to show rapid performance by imposing even unethical means and ways. My pesonal view point is to support and promote these small entrepreneurs by avoiding unethical pressures and short cuts and should think long term. No one can bring overnight change but in this case it seems that JT wants overnight results which can be harmful for the Company/Company staff/franchisees. Seems franchise are working in organized way for this protest. Because, I heard similar letters from them to Ufone as well. Either some telecom is bribing them or they are taking undue advantage of being business partner and distributors. Ufone franchisees are profitable business enterpenour in enitre telcos in Pakistan. This is not true that Ufone franchisees submitted anyting to their management. said comments in letter are totally counterfeit form franchises. I am requesting to to you all, please do not burn your own boats on the feedback of some blacksheeps. C3 has always a top region, no matter who is VP, Director and RSM. History says its always a performing region, because of its franchisees and not because of company people & product. How has the validity/credibility of this letter been investigated? We contacted at least four franchisees in Multan, who confirmed that they were CCed this letter as well. I am an annoyed customer of them….! Seems looking majority of franchises working with their contractor under pressure ,But regarding the issue they are liable to create such a way conditions .but the other way the company policy for franchisees change day by day ,franchise committed these kind rules and policies with highly pressure and blackmailing …..! AJK ZONE AP SA MILNA CHATA HA.